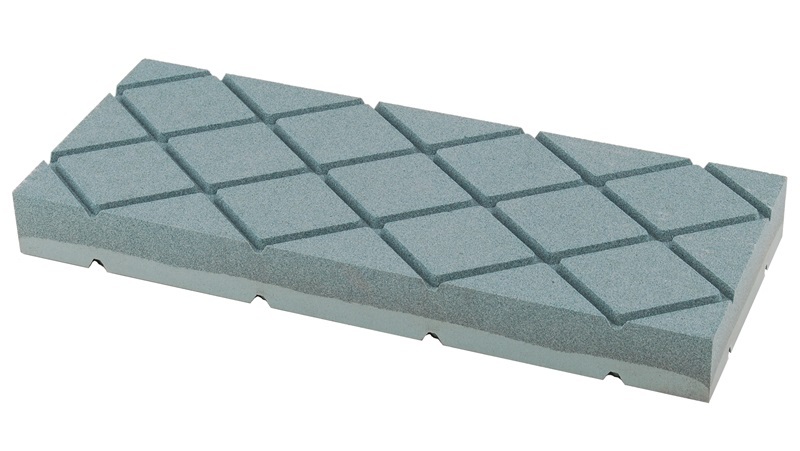 Our Most Popular Flattening Stone! When we set out to create the ultimate flattening stone, our objectives were to create the best flattening stone possible, while still keeping it affordable. We met our goals and we're happy to show you the finished product. When creating the stone, we first had to define what made a great flattening stone. We came up with 5 important factors. First - It must be very flat. Second - It must be large enough to flatten any water stone with ease. Third - It must be made with the best material. Fourth - It must flatten all water stones quickly and leave a good finish. Fifth - But, certainly not least important - It must be made in the USA. 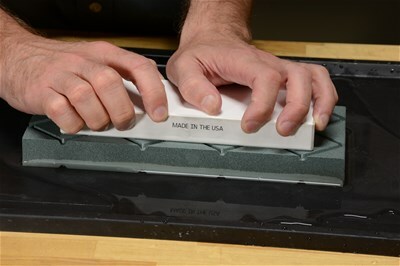 When our flattening stone is made, care is taken to ensure that it comes out of the mold flat. That flatness is critical because that is what determines how flat you can make your stone. We take two additional steps when ours are made. First, each stone is hand lapped to ensure flatness. It takes time to do it, but that is the only way to make it flatter. Second, each stone is precisely measured to ensure flatness. If it doesn't pass the test, it is sent back for additional lapping. The size of the flattening stone matters for a few reasons. The larger stone is easier to use as your water stone stays on the surface. But total wear is another benefit. 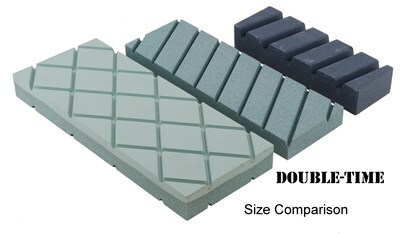 Our large (10" x 4") double-sided stone has 80 square inches of total flattening surface. That is almost 3 times the wearable area of other popular flattening stones. Seeing the Double-Time Flattening Stone next to other popular flattening stones shows the size difference. And, it's double-sided! We chose green silicon carbide as our abrasive material for our flattening stone because it is extremely hard and the particle shape cuts aggressively. It is harder than aluminum oxide, and also harder than the less expensive black silicon carbide. This makes it ideal for flattening as it cuts quicker and wears slower. Just like with sharpening an edge, the coarser the grit the faster the cutting action. However, the coarser the grit the coarser the surface it will leave. We experimented with different grits to find the best overall option. We wanted to find a better solution to that compromise. Our solution was to make it double-sided. Something we have not seen on any other flattening stone before. The coarse side is a very fast cutting 120 grit. Especially when working on coarse water stones, this side provides the necessary cutting action to effectively flatten the stone. However, when flattening finer stones, a coarse grit leaves a finish that many find undesirable. That is why we put a 320 grit surface on the fine side. On water stones 1000 grit and higher, we recommend using the fine side to put a nice surface finish on the stone. The fine side can even be used alone on very fine water stones to put a fresh flat surface on your stone. 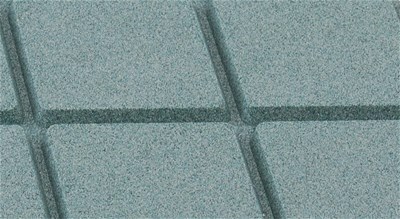 In addition, the distinctive grid pattern of the grooves clears waste material quickly and efficiently, aiding the fast cutting action on both sides of the Double-Time Flattening Stone. We've supported US manufacturing since we started and that continues to be important to us. When we set out to create our new flattening stone, we knew we could make a great flattening stone in the US. We feel that everyone benefits when quality products are made in the USA. We're not only supporting the economy, but we are producing a product with a quality that everyone can appreciate. We're so confident that you'll like the Double-Time Flattening Stone that we're backing it up with a 100% satisfaction guarantee. If you're not happy with any aspect of the stone, just let us know and we'll gladly replace or refund your purchase. Q. Does this work with all water stones? A. Yes, we've tested it on many different water stones and it works well on all water stones. Q. Can I flatten Arkansas Stones with the Double-Time Flattening Stone? A. No. Arkansas Stones are much harder than water stones and will cause excesssive wear to the Double-Time Flattening Stone. We do not recommend using it for flattening them.